Engagement Sessions are just so much fun, especially when you know the people that you’re taking the pictures of!!! I’ve been friends with “T” for probably 6 or 7 years now. I met her playing softball as well as her new man, “J.” I knew that I’d be trying to keep a straight face during the majority of the session and I was right, that “J” can make me crack a smile. Thanks you two! I hope that you like ’em!! Mom and mom are best friends. These little darlings are just 4 days apart!! I was so worried about trying to get them to sit still long enough to take a few pictures but they did so good. And it’s always good exercise for me trying to squat and follow them around for 2 hours just waiting….. I already took pictures of one of the girls just last week (see 2 posts down) so we did a few of just Lili and her mom. 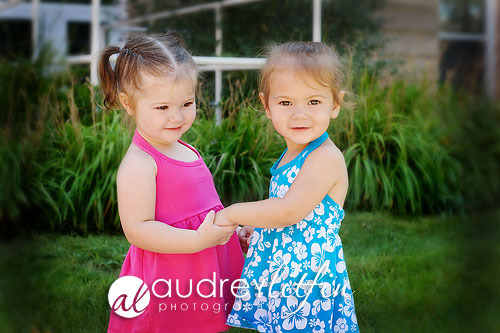 I hope that if I ever have kids of my own, they are this cute!! What a fun experience, my first bridal session! It was so nice to be able to photograph the bride without all the stress of a wedding going on!! She was such a sweetheart too, thanks “K.” Have a blast in Cancun!!! Grace - This was your first bridal session?! I don’t believe you! Really fabulous photos Audrey. Meet Kylee…what a cutie! I had the pleasure of taking her pictures ON her 2nd birthday. She was so much fun, I just can’t get enough of that adorable face. It took her a few minutes to warm up but once I pulled out a chair for her to stand on, a suitcase for her to sit on, and she heard a few trains going by, we were rolling!! phxxguy - How do you get your photos to post like this? Like a gallery … is there a software you have to use? I use marsedit for posting and I would like to know how to make a gallery look like you have here. Any help would be awesome! Shabby Miss Jenn - GORGEOUS new bloG! Love those pictures too Audrey!!!!! Grace - Thanks for stopping by and leaving a comment. And congrats on the new blog!